Welcome aboard Silversea Silver Cloud. 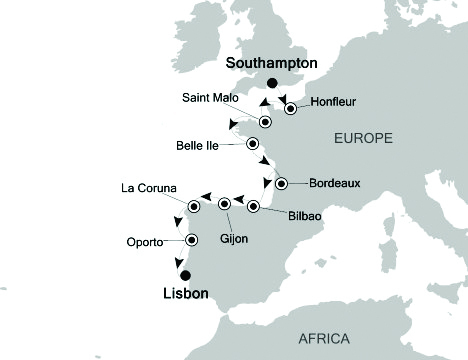 We’re heading out tonight from the great port of Southampton to cross La Manche, the English Channel. Ahead of us lies the beautiful town of Honfleur, mostly untouched by the winds of war. And beyond a great tour of treasures like Saint-Malo, Bordeaux, and into north Spain to Bilbao, Gijon, La Coruna, and down to Porto and Lisbon. I hope you’ll join me here for photos and updates on our voyage.